In its classical form, a consistent replicated service requires all replicas to witness the same evolution of the service state. If we consider an asynchronous message-passing environment in which processes might fail by crashing, and assume that a majority of processes are correct, then the necessary and sufficient information about failures for implementing a general state machine replication scheme ensuring consistency is captured by the \(\varOmega \) failure detector. This paper shows that in such a message-passing environment, \(\varOmega \) is also the weakest failure detector to implement an eventually consistent replicated service, where replicas are expected to agree on the evolution of the service state only after some (a priori unknown) time. In fact, we show that \(\varOmega \) is the weakest to implement eventual consistency in any message-passing environment, i.e., under any assumption on when and where failures might occur. Ensuring (strong) consistency in any environment requires, in addition to \(\varOmega \), the quorum failure detector \(\varSigma \). Our paper thus captures, for the first time, an exact computational difference between building a replicated state machine that ensures consistency and one that only ensures eventual consistency. 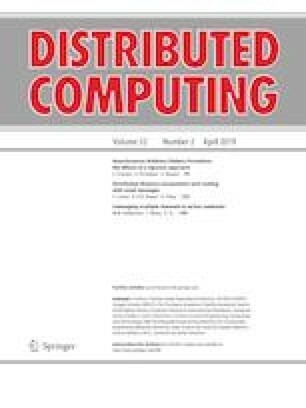 A previous version of this work appears in the proceedings of the 2015 ACM Symposium on Principles of Distributed Computing . P. Kuznetsov:The research leading to these results has received funding from the Agence Nationale de la Recherche, under Grant Agreement ANR-14-CE35-0010-01, project DISCMAT. We would like to thank Vassos Hadzilacos and the anonymous referees for their helpful comments.